Flexibility. Quality. Guaranty. Expertise. Service. 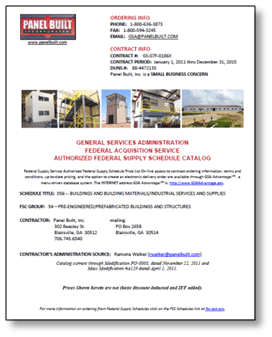 Panel Built, Inc., was awarded our GSA contract in December 2010 as a small business concern offering total modular office storage solutions to government agencies at the best quality and best price our industry has to offer. Panel Built is the top manufacturer of prefabricated modular exterior buildings, in-plant office space, and mezzanines to provide for standard applications and custom solutions. Panel Built exterior buildings are ideal for many applications: field offices, on-site consultant space, machine storage, sub-station enclosures, guard houses, and more. Our one-, two-, and three-story in-plant offices can accommodate any space need. Our buildings structures can be purchased as pre-assembled or built on-site your site. Available in a variety of surface finishes, these versatile structures go up in a fraction of the time and cost of traditional “stick-built” construction. Our steel line fabricates powder-coated structural steel mezzanines and stair systems are to your specifications . We manufacturer free standing structural steel mezzanine systems, prefabricated stairs, handrails, swing gate, openings, cantilever decks, landings and ladders. Choose from a variety of decking materials including Resindek ®, AdvanTech, bar grating, and more. Finally, Panel Built offers the complete package with our very own installation team. Although our structures come pre-assembled on a forkliftable steel base or ready to easily assemble – our team of experts are ready to help.